The Dead of the 75th Battalion, Canadian Expeditionary Force. 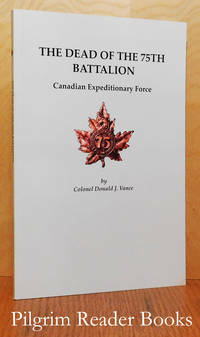 By Vance, Colonel Donald J.
Bancroft, Ontario. : Privately published.. Very Good+. 2004. Softcover. 0968825532 . 8vo - 23 x 15 cm. ; 111 pp. After an 8 page introductory foreword and a 1 page glossary, this book contains lists of those who died, by year, alphabetically, by service number and chronologically. Four pages of notes, a 2 panel fold-out map of the Western Front at the back. The 75th Battalion was part of the 11th Infantry Brigade, 4th Canadian Division in France and Flanders during World War I. A new and unused book with just a bit of soiling on text block fore-edge. .
Building an Army: Mobilization of Manpower in the Army of the United States. Harrisburg, Pennsylvania. 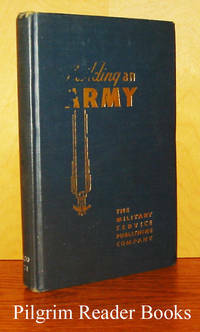 : The Military Service Publishing Co.. Good with no dust jacket. 1941. First Edition. Hard Cover. 12mo - 19 x 12.5 cm. ; xvi - 159 pp. Blue cloth over boards with gilt lettering and decorations on the front board. Edward Johnston was a Lieutenant Colonel in the Infantry, United States Army and looks at the military readiness of the US Army as it prepares to enter the Second World War. Six page glossary and a 13 page index. The library was an Officer's Mess with fairly minmal and neatly done markings - call number on spine, ownership note on the front paste down end paper and a pocket on the back paste down end paper. The board fore corners are mildly bumped and some of the gilt lettering on the front board has been rubbed off. The interior is clean and the binding is solid. A clear and removable archival cover has been fitted. ; Ex-Library . Boston, Massachusetts. : Christian Science Publishing Society.. Very Good with no dust jacket. 1922. First Edition. Hardcover. 8vo - 21.5 x 15 cm. ; (2) - 378 pp. Dark blue cloth over boards with gilt lettering on the spine and the front board along with blind stamped border rules on the front and back boards. The text block head edge is gilt as issued. The fore and tail edges of the text block are untrimmed, again as issued. Illustrated with 35 pages of black and white photographs printed on a coated paper stock. Various lists of workers and committee members are present. A few fore edges of the pages are yet unopened. The book shows mild wear to the externals (fore corners and spine tips) and with a faded (or mottled from the sun) spine. The interior is clean and the binding is good. A clear and removable archival cover has been fitted. .
Chicago, Illinois. : Chicago Gospel Tabernacle.. Very Good. Softcover. 8vo - 21.5 x 15 cm. ; 56 pp. Rebound as a soft cover and not a professional rebinding. No date given but appears to be soon after the Second World War. Author's photograph from the original cover tipped in on the inside of the front cover. 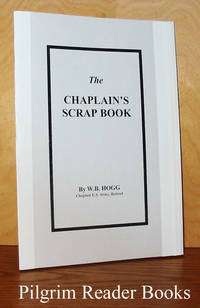 William Hogg was a chaplain in the US Army during World War II. The text pages are browned with some minor wear to the edges of a few pages that does not affect any text. Previous owner's pencilled name on the title page. .
Toronto, Canada: McClelland, Goodchild & Stewart.. Very Good with no dust jacket. 1916. Hardcover. 12mo - 19 x 12 cm. ; 175 pp. Third impression, December, 1916. A very immediate look at a Canadian soldier's life in World War I. 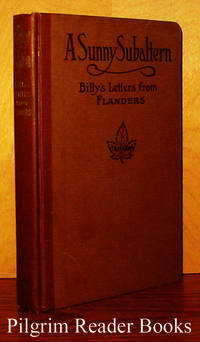 These letters were written to and published by Billy's mother. 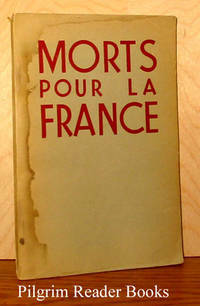 The letters cover a period of time from November 1915 to August 1916; book ends with a moving "Moriturus Te Salutat", to the memory of a fallen comrade referred to only as McCarthy. 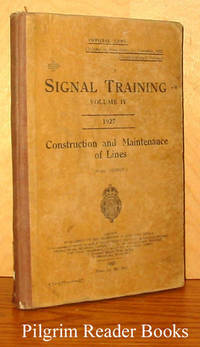 Brown paper-covered boards with brown cloth spine, gilt spine lettering, brown lettering on front board. Text block is foxed, former owner's name on front free endpaper; binding is solid, text is otherwise clean. .
Washington, DC. : National Defense University Press.. Near Fine. 1997. Softcover. 1579060358 . 8vo - 23 x 15 cm. ; l - 421 pp. 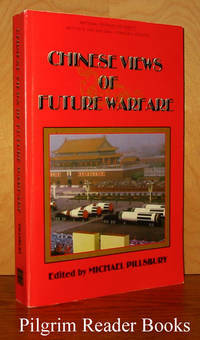 A collection of articles about warfare by Chinese authorities, the publication of which was made possible by the willingness of Chinese authorities to make available to the west, previously inaccessible material. The articles are grouped into 4 main sections: 1 - Deng Xiaoping's doctrine of future types and causes of warfare, 2 - China's future threats or security environment, 3 - Short term future challenges for possible local war, 4 - Long term future warfare and the revolution in military affairs. previous owner's name on the first page and the back cover has a small dog-ear creases in the top fore corner. Otherwise clean and tight with the appearance of having never been used. .
London: Odette Keun and British Continental Syndicate.. Very Good. 1944. Hardcover. 12mo - 18.5 x 12 cm. ; 135 pp. Subtitled: Marshes of Invasion, Valley of Conquest and Peninsula of Chaos. Keun, an essayist and part of an international group of liberals with eyes on world affairs and the rise of totalitarian ideologies, writes of her concerns for the post-World War II situations in what she terms "the Middle Zone of Europe", ie, Finland, Latvia, Lithuania, Poland, Czechoslovakia, Hungary, Rumania, Yugoslavia, Bulgaria, Greece. A clean, tight volume with a bit of small staining on cover and bumped corners. .
London & Toronto / New York. : J. M. Dent & Sons / E. P. Dutton.. Very Good with no dust jacket. 1917. First Edition. Hardcover. 12mo - 18.5 x 12 cm. ; ix - 269 pp. 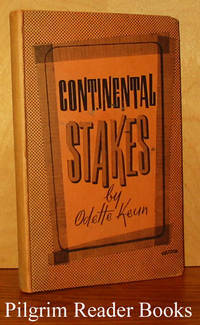 A first edition published simultaneously in the USA and the Commonwealth. Printed at the Temple Press of Letchworth, England. Blue cloth over boards with gilt lettering on spine and a blind stamped publisher's device on the front board. The text block head edge is stained blue as issued. Black and white frontis "One of the Writers" from a drawing by C. Coppède. A collection of letters and excerpts from letters from Italian soldiers and others directly associated with the war with a running commentary and associated text by Steege. The translations are by the author. Both free end papers are tanned, the externals show mild shelf wear and that on the spine tips and board corners. The interior is clean and the binding is sound and solid though not very supple as the backing glue has stiffened with age. .
Munich, Germany. : Verlag Kurt Desch.. Very Good in Very Good+ dust jacket. 1963. Hardcover. 4to (small) - 25 x 18 cm. 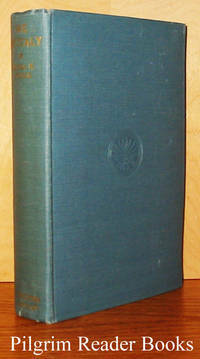 ; Volume I: Erster Band: Der europäische Krieg 1939-41. 479 -  pp. Volume II: Zweiter Band: Der Weltkrieg 1941-43. 478 -  pp. 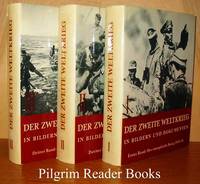 Volume III: dritter Band: Sieg ohne Frieden 1944-45. The texts are in German. All are bound in on off-white coarse linen cloth over boards with red lettering on spine and front and with photographic end papers. Profusely illustrated with period photographs along with maps, charts and graphs. The end paper hinges in volume 1 are torn though the mull cloth is still good. All three dust jackets show minor edge wear and the spines are a tad darkened. All three volumes come with the original and plain individual board slip cases which are showing wear. .
Washington, DC. 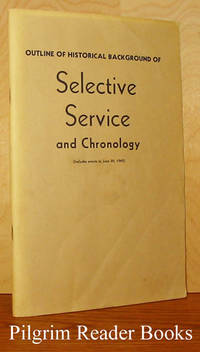 : Selective Service System.. Good. 1965. Softcover. 8vo - 23 x 15 cm. ; iv - 66 pp. Tan wraps with black lettering in a saddle stapled binding. "From Biblical days to June 30, 1965". Includes 14 tables of statistics and related information from the Service's files. Mild wear and soiling to the covers and the last page (not numbered and blank) is missing the top fore corner and is quite creased. .
London, UK. : His Majesty's Stationary Office.. Good. 1927. Hardcover. 12mo - 18.5 x 12 cm. ; vii - 171 pp. Tan paper over boards with brown cloth on spine. One fold-out drawing of a plug and socket panel facing page 136 and three more fold-outs, two charts and one map, at the back. Previous owner's name (a Corporal Morse of the signal corps) on the inside of the front cover. The book shows moderate wear and soiling with a tear in the cloth spine at the tail. The back free end paper is torn at the tail end of the gutter. Quite clean inside and the binding is solid. .
Burnstown, Ontario: General Store Publishing House. Very Good. 1993. Softcover. 0-919431-69-0 . 8vo - 22.5 x 15 cm. ; 201 pp. 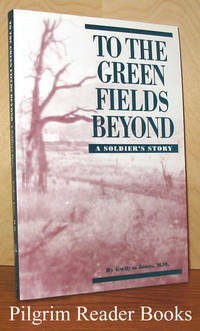 Jones' story of his part of WWII, through Italy into Holland. "His perceptive eye records the telling contrast between grisly military encounters and his between-battles explorations among the architectural and artistic treasures of Europe. . . . thoughtful, humane, somethime humorous." 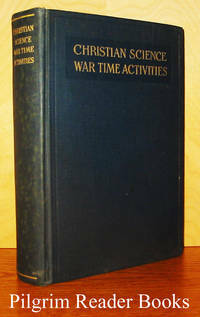 Included in this account are photos, maps of war operations, messages of Generals Alexander and Leese and Montgomery, some poetry by Jones, highlights of the First Canadian Armoured Brigade, honours and awards conferred on members of the Three Rivers Regiment. Minor wear on cover, former owner's name on title page; binding sturdy, text pages otherwise clean. .
La Table Ronde. Very Good-. 1967. Softcover. 8vo - 24 x 15.5 cm. ; 342 pp. Text is in French. 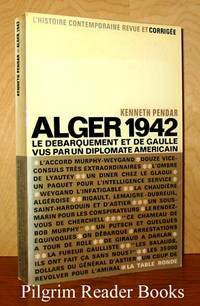 Traduit de l'Anglais par Jean Bourdier. L'Histoire Contemporaine Revue et Corrigee. Photos, appendices, index. Flapped card stock covers sunned with soiled text block edges; text pages clean, binding sturdy. .
Kiev: Vydavnytstvo politychnoi literatury Ukrainy. Good. 1969. Hardcover. 8vo - 24 x 17 cm. ; 453 pp. Text is in Ukrainian Cyrillic. Volume three only. 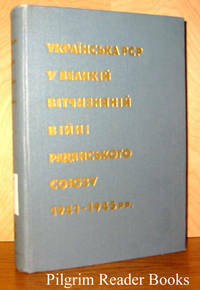 Tells of the Ukrainian Soviet Republic's role in the history of World War II; this volume deals with the event of 1944-1945. 14 fold-out maps, one fold-out chart, lots of b/w pictures. Grey cloth-covered boards with gilt lettering on front and spine. Light wear to boards, binding shaken; library markings consist of spine sticker, stamped text block, card pocket on front endpaper. ; Ex-Library . Moscow, Russia. : Voennoe Izdatel'stvo Ministerstva Oborony SSSR. Good. 1969. Hardcover. 8vo - 20 x 12.5 cm. ; 246 pp. Text is in Russian Cyrillic. A brief historical outline of the artillery actions in some of the biggest operations of the Second World War: the battles for Moscow, Stalingrad and Kursk, as well as the Belorussian and Berlin operations. Photos. 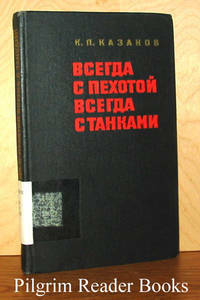 Black cloth-covered boards have light edgewear, bit of tearing at binding joins on two pages; library markings consist of spine label, stamped text block, attachments on front endpaper. ; Ex-Library . Washington, DC. 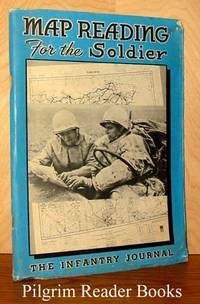 : The Infantry Journal. Very Good. 1944. First Edition. Softcover. 4to - 25.5 x 18.5 cm. ; 101 pp. Staple bound with photographic wraps (yapped edges of approximately .5 cm.). A text adapted from the Army's Elementary Map Reading program along with materials from the Engineer School at Fort Belvoir, Virginia. The back pocket includes a small protractor, map scale and 5 of the original 7 maps it was issued with: France and Belgium, New York and West Point, Alger, Berlin, "Hand Land". The yapped edges are creased and the covers are mildly scuffed. Interior is clean and the binding is solid. .
Canada. Good. 1944. Softcover. 4to - 26 x 18 cm. ; 36 pages including covers. Reprinted from the Canadian Geographical Journal of November 1944. 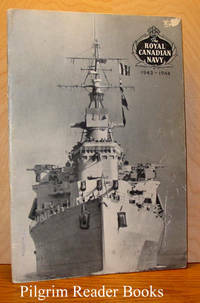 A profusely illustrated account of the activity of the Royal Canadian Navy during the years 1943-1944. Moderate wear and scuffing to the covers with a vertical crease to the whole from being folded. .
London: Societe des Editions de la France Libre. Fair. Softcover. 12mo - 18.5 x 12 cm. ; 78 pp. Text is in French. No copyright date but letters dated 1941-1944. A collection of letters written by people executed by the Germans during occupation of France. Some of those whose letters are in this collection: Jean Catelas, Pierre Semard, Paul Gery Gabriel Peri, Henri Martel, Abbe Rene Bonpain, Daniel Decourdeman che, Louis Caron . . . . Paper wraps have a bad water stain on the front and a stain on the back, former owner's name on title page; interior pages are in good shape. . Very Good. Softcover. 12mo - 18 x 12 cm; 42 pp. The text is in Polish. Printed in Scotland by Allan Fowler Ltd. Centre-stapled booklet. 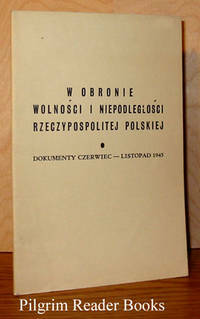 Examples of the 18 documents contained in this booklet: Oredzie prezydenta R. P. do Narodu Polskiego z dnia 29. VI. 1945; Telegram Ministra Spraw Zagranicznych do ministrow Eden'a i Byrnes'a z dnia 24. VII. 1945. 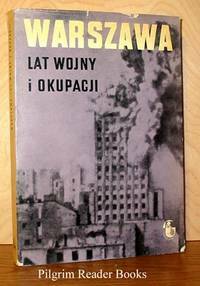 Minor wear on covers. .
Warszawa: Instytut Historii Polskiej Akademii Nauk. Very Good in Good+ dust jacket. 1972. Softcover. 8vo - 24 x 17 cm. ; 366 pp. The text is in Polish. Footnotes, index. Studia: Podziemna prasa Zwiazku Walki Mlodych; Muzyka w Warszawie podczas okupacji hitlerowskiej; Polski Czerwony Krzyz w Warszawie w latach wojny i okupacji hitlerowskiej; Instytucje pomocy spolecznej w getcie warszawskim; Jawne wydawnictwa i prasa w okupowanej Warszawie; Okreg Stoleczny Stronnictwa Narodowego; Policja granatowa w Warszawie w latach 1939-1944. Materialy: Technika warszawska PPR; Ludnosc cywilna i prasa powstanczego Zoliborza; "Kurier Mokotowski" i srodowisko Robotniczej Partii Polskich Socjalistow i Polskiej Armii Ludowej; Wspomnienia redaktora "Warszawianki"; :Warszawianka"; Biblioteki warszawskie. Light soiling, some edgewear to card stock covers, edges of a few pages creased. Dust jacket has sunned spine, some soiling, edgewear. .